The following advice should be used in conjunction with other sections of the site, such as the candle fire safety page, due to the fact that candles are also used more and more at this time of year. Many people ask what is the best method of extinguishing a Christmas Tree fire should they be unfortunate to experience one. 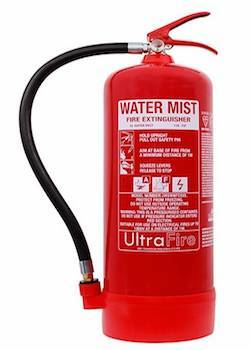 The simply answer is that the UltraFire Water Mist extinguisher from Safelincs is the perfect option. Special fire safety precautions need to be taken when keeping a live tree in the house. A burning tree can rapidly fill a room with fire and deadly gases. This can be demonstrated by viewing the following video. Furthermore the best way to tackle a Christmas Tree fire is by the use of a Water Mist Extinguisher which you can see by viewing the following video.